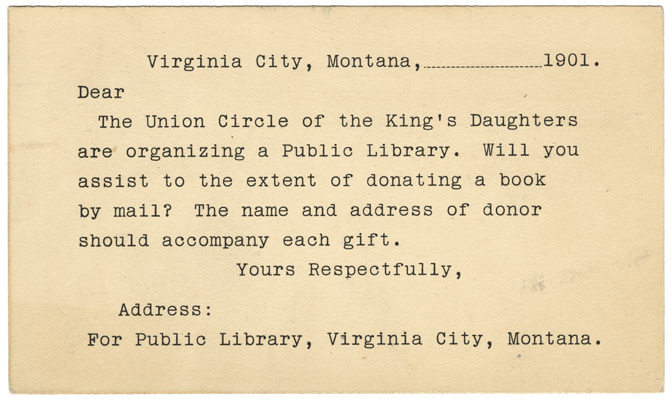 Rising to the call, women’s clubs founded libraries in communities across Montana. Most of these libraries started small: club members donated books, and a local milliner, dressmaker, or hotelier would offer shelf space. As the library (and the community) grew, it often moved to a room in city hall before, finally, opening in a separate building. By 1896 Montana could boast seven public libraries with collections of a thousand volumes or more, and the State Federation of Women’s Clubs maintained a system of traveling libraries. At the turn of the century, library advocates in Montana received a boost from the Carnegie library grant program, which made funds available for library buildings if communities could prove they would provide a building site and tax support for the library’s ongoing operation. In the first two decades of the twentieth century, seventeen Montana communities built public libraries using Carnegie funds. Red Lodge’s library history is typical of many Montana communities.The local woman’s club opened the first library in the Savoy Hotel in 1914. The woman’s club then lobbied the City Council to apply for a grant from the Carnegie foundation to construct this building, completed in 1920. Photo courtesy of the State Historic Preservation Office. The history of Carnegie libraries has been well documented, and this focus has led library historians to emphasize the mayors and city council members who submitted the grant requests to the Carnegie Foundation. While library historian Daniel Ring, for example, acknowledges women’s contributions, he also underestimates their significance. “At least 50 percent of the pre-Carnegie Montana libraries owed their founding to the civic-minded women,” according to Ring, and “When the Carnegie libraries came on the scene, it was usually women’s clubs that alerted the city’s power structure to the idea of obtaining a grant.” However, he emphasizes, “the women could not act alone. Without the support of the male business elite, they were powerless.” Thus, he delegitimizes women’s political activism. Like many scholars of women’s history, Scott recognizes that “Historians, looking at the past, do not see all that is there.” Until recently, historians have overlooked and underestimated women’s contributions to library development—in Montana and elsewhere—as well as their work sustaining libraries after construction. Members of the Miles City Woman’s Club, for example, made fund-raising for the town’s Carnegie Library their “main objective” after the building was completed in 1902. And they were not alone. 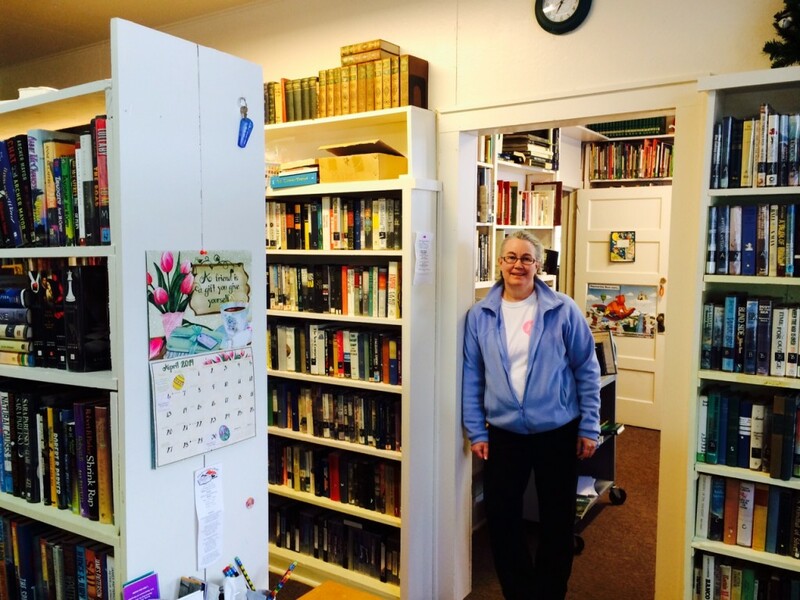 Today, East Glacier still relies on woman’s club volunteers to staff its library. 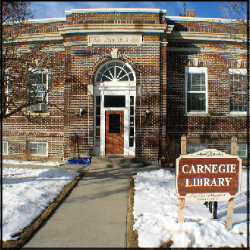 Learn more about the Red Lodge Carnegie Library (and other historic sites related to women’s history) on our Places page. Barger, J. Wheeler. “The County Library in Montana.” Bulletin no. 219, University of Montana Agricultural Experiment Station, Bozeman, Montana, January 1929. Copy in Libraries, Public, vertical file. Montana Historical Society Research Center, Helena. Hamilton [Montana] Woman’s Club Records, 1913-1989. MC 212, Montana Historical Society Research Center. Martin, Marilyn. “From Altruism to Activism: The Contributions of Literary Clubs to Arkansas Public Libraries.” The Arkansas Historical Quarterly 55, no. 1 (Spring 1996), 64-94. Richards, Susan. “Carnegie Library Architecture for South Dakota and Montana: A Comparative Study.” Journal of the West, July 1991, 69-78. Copy in Libraries, Montana, vertical file, Montana Historical Society Research Center. Ring, Daniel. “Carnegie Libraries as Symbols for an Age: Montana as a Test Case.” Libraries & Culture 27, no. 1 (Winter 1992), 1-19. Scott, Anne Firor. “On Seeing and Not Seeing: A Case of Historical Invisibility.” The Journal of American History 71, no. 1 (June 1984), 7-21. ________. “Women and Libraries.” The Journal of Library History 21, no. 2 (Spring 1986), 400-405. Smith, Clare M. “Miles City Carnegie Library.” The Montana Woman, April 1968, 9. Copy in Libraries, Montana, vertical file, Montana Historical Society Research Center.